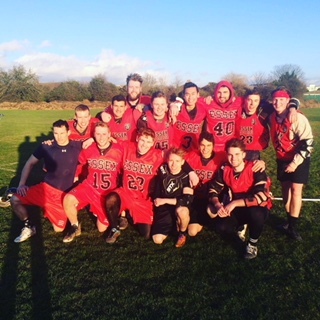 Junior Jerry Santiago joined a lacrosse team at the University of Essex while studying abroad. So, my experience studying abroad could be called unusual to say the least, but not at all dull. During the first week in my host university (University of Essex), I met with a person called Reinis, who one of my friends back at CUA recommended I contact to help me get accustomed to life in Essex. Right away, the guy offered to help me with anything I needed and invited to join his lacrosse team. At first, I was hesitant to join lacrosse, since I have never played before and I thought it would be too much of a commitment for an abroad student like myself. However, I’m always a proponent of trying new things and seeing where they lead to, so I accepted his offer. I went to Essex’s lacrosse practice and right away all the players started greeting me and welcoming me into the team. We had conversations, practiced on our skills, and started making jokes. I was very thrilled with the team and I agreed to keep coming to the practices and to their socials. At their socials, I met with all the male and female players and the members of the lacrosse club. The socials were a hilarious experience, because in each social there is a theme. Whether it’s Harry Potter, babies and grandpas, or gender bender, we all dress up to the theme, have a party in a house, and go to the club. I really connected with my fellow lacrosse mates in these events and they quickly accepted me as part of the group and even let me play in one of the games against a rival university. Yet, my interactions with them were not limited to lacrosse only, since then I found myself being invited to their houses and hanging out with their friends and expanding my friend group around the University. I also got to travel with them to other towns in England and around Europe. Just last week me and some guys, including Reinis, went for a 5-day trip to Stuttgart, Germany, where we visited towns and watched a soccer match. Next month, the entire club is planning on going to a tour in Croatia and obviously I’m going! 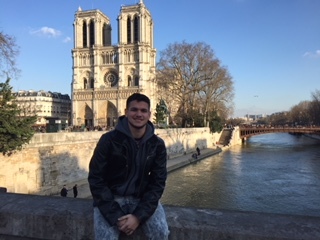 This just goes to show that you never know what opportunities lay awaiting when you take the big step of studying abroad and being open to new things!